Newly elected House GOP Conference Chairwoman Liz Cheney, R-Wyo., has been a vocal critic of Rep. Steve King, R-Iowa. Pressure mounted on Iowa GOP Rep. Steve King on Tuesday as a top House Republican leader called on him to resign over his recent comments to The New York Times on white supremacy. 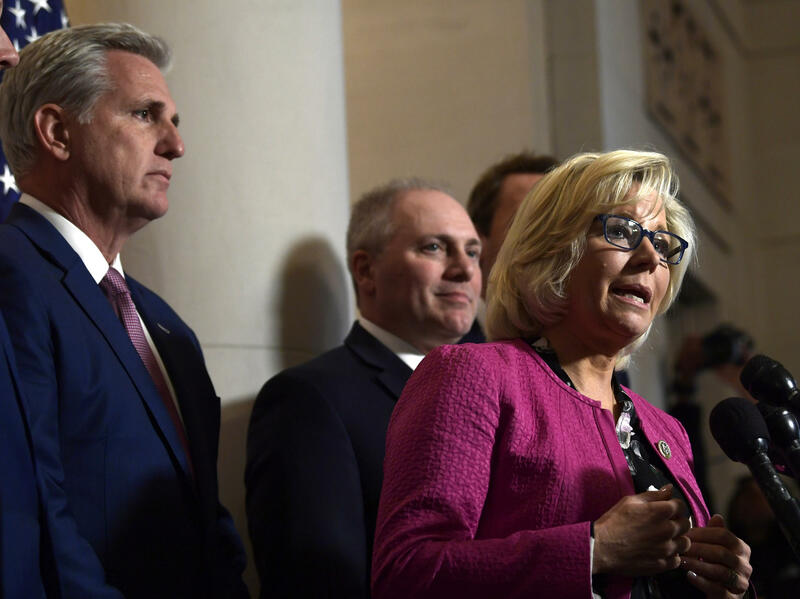 "We do not support it or agree with it, and as I said I think he should find another line of work," House GOP Conference Chairwoman Liz Cheney, R-Wyo., told reporters Tuesday morning. Later Tuesday, the House voted 424-1 on a resolution of disapproval offered by Majority Whip James Clyburn, D-S.C., that cites King's comments and rejects the ideologies that fuel white supremacy and white nationalism. "We have reached a tipping point. Racial divisiveness is a fault line that is ripping our nation apart. This body must speak out against this evil," Clyburn said on the floor. Democrats wanted to move swiftly to hold the vote Tuesday, which is Martin Luther King Jr.'s birthday. King voted for the resolution. In brief remarks on the floor he reiterated that he was taken out of context and does not espouse racist views. "I'm putting up a 'yes' on the board here because what you say is true, is right and is just," King said. Cheney, who was recently elected to the third-ranking GOP leadership post, was one of the first House Republicans to criticize King and characterize his words as "racist" following a Times story last week in which he was quoted questioning why the term white supremacy had become offensive. Unmoved by his King's own defense, House Republicans led by Minority Leader Kevin McCarthy, R-Calif., acted swiftly on Monday to strip him of his committee assignments on the Agriculture, Judiciary and Small Business panels in the new Congress. King denounced that move as a "political decision." One House Democrat, Bobby Rush of Illinois, voted against the resolution of disapproval because he said it does not go far enough. Rush is the author of a censure resolution — a more formal punishment that requires a lawmaker to stand in the well of the House chamber to face his colleagues for the rebuke. He is pushing for a vote on his resolution as early as Wednesday. Congressional Black Caucus Chairwoman Karen Bass, D-Calif., told reporters she would like to see Republicans vote to eject King from their conference — a move that would bar him from attending weekly party meetings. McCarthy said Monday that King will still be allowed to attend conference meetings. President Trump hung over the debate on the House floor. "Today, Madame Speaker, I ask one question: Where does President Trump stand on this resolution?" asked Rep. Raja Krishnamoorthi, D-Ill. "Will President Trump do as we are doing and reject white supremacy in all its forms? So far we have heard nothing but silence." The president has sidestepped the King debate, telling reporters on Monday that he has not been following it. House Republicans rarely criticize the president when he makes racially inflammatory remarks, but many top Republicans used the King incident to make a stand against racial bigotry. "And as long as we ever have anyone in this country that believes that they can climb to the top on the backs of others because they make fun of their race, their gender, their ethnicity or any other thing, then we value and devalue the very breath that God gives us," said Rep. Doug Collins, R-Ga., the ranking member on the House Judiciary Committee. Senate Majority Leader Mitch McConnell, R-Ky., who said Monday about King there is "no place in the Republican Party, the Congress or the country for an ideology of racial supremacy of any kind," dodged a question Tuesday about why he publicly called out King but has not criticized any of the president's insensitive statements about race. "It's been my practice for the last couple of years not to make sort of random observations about the president's tweeting and other things," McConnell said.